SAL DeTRAGLIA'S VIRTUAL TAPAS BAR: SWEET NUN THINGS. Roman Catholic nuns have many talents—not all of which involve the infliction of corporal punishment. In Spain, at least, nuns wield a wooden spoon as skillfully as they do a wooden ruler. Perhaps I should clarify that last statement. Cities and towns throughout Spain are dotted with cloistered nun convents. Most convents run some sort of commercial venture – e.g., charging admission to view their art collections, or selling needlecraft and other hand-made trinkets – in order to support their existence and charitable endeavors. But the most common (and popular) way for nuns to raise funds is to make and sell sweets. Nun-made sweets range from almond-based cookies (like the Rosquillas de Almendra pictured above) to jellies and marmalades to moist little buttons of sugar and egg yolk called yemas. Some convents specialize in one or two items; others offer of a long list of choices. Offerings are typically influenced by the availability of local products—and donations. 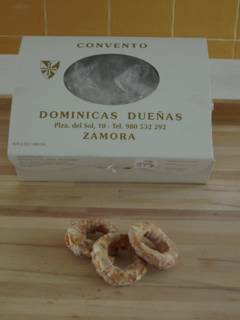 Yemas, for example, are often available at convents in wine regions. Why? Because many wineries use egg whites to clarify their wines, then donate the yolks to the nearest order of nuns. But it’s not just the sweets that cause me to seek out convents whenever I visit a new city. I get equally excited by the transaction itself. Suffice it to say, a certain etiquette must be followed when buying from nuns. Let me tell you what it is. When a convent is open for business (typically between the hours 9am to 2pm and 5pm to 8pm), the front door will be cracked open. Enter through the door and you will often find yourself in a foyer. Built into the far wall of the foyer is a Lazy Susan-type revolving tray. If you’ve seen that famous M*A*S*H episode in which the doctors gave an abandoned baby to a community of cloistered monks, then you know what I’m talking about. Now you may place your order. Once you do so, the nun will tell you the price. Put your money on the Lazy Susan, and give it a gentle spin. The nun behind the wall will take your money, put the box of sweets that you ordered (plus your change, if any) on the Lazy Susan and spin it back to you. And that’s it! The transaction is over. The nuns walk away with the money. You walk away with the sweets. And nobody’s knuckles get whacked with a ruler. Your anonymous friend from Denmark. Conceived without sin? Oh damn! That's a typo. I meant to say "Conceived without Gin." Wait a minute! Conceived without Gin?! That's rarer still. I can assure you and all your readers that you were indeed conceived without sin - having been born 9 months and 14 days after a wedding ceremony.